8 bi-weekly sessions - class size is limited to 4 participants. Whether just for yourself, or using to help others, you will take away how to diagnose and help improve problem energy areas affecting mental, physical and spiritual well-being, as well as a personal Chakra gem bag for yourself. Full course description shown below. A $50.00 deposit is REQUIRED to sign up. It will be applied to the total class cost of $200 or you may optionally pay in full. After paying the $50 deposit, you can also pay the balance on week 1 or $50 on sessions 1, 3 and 5. We start with the basics of choosing the right crystals, cleansing and crystal care, crystal systems and shapes. Handouts and crystal with pouch are provided. During weeks 2 through 8, you will learn about the stones, oils and colors associated with each of the 7 major Chakras. Healing layouts, associated mental, physical and spiritual aspects and hands-on exploration of associated gems is also covered. 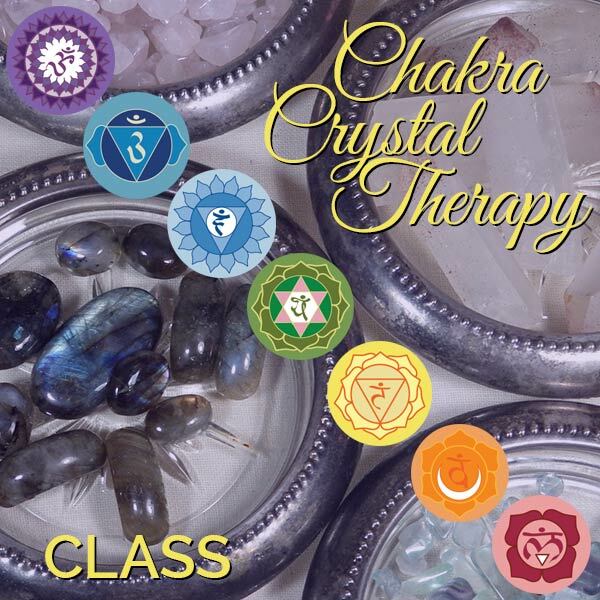 A personal gem is selected for you for each chakra which you can keep in the provided pouch with your crystal quartz wand from our first class. At the end of session 8, participants will receive a Crystal Practitioner Completion Certificate.